Great requittal. September. 06, 2018 08:06. .
No one can live by himself or herself. One would need help from others or give help to others from time to time. Although German Neoclassical painter Johann–Heinrich Tischbein succeeded as a court painter, he had help from a total stranger when he was in need. The helper was Johann Wolfgang von Goethe depicted in this painting. Why did the painter paint the great German writer against the wilderness of foreign land? Tischbein was from a family of famous German painters. Working as a portrait painter in Berlin, he moved to Rome in 1779 to study classical art on scholarship. Having spent all his money two years later, he settled in Zurich, before returning to Rome in 1783 thanks to winning a scholarship on Goethe’s recommendation. The recommendation was arranged by a poet whom Tischbein made friends with in Switzerland. In fact, Tischbein and Goethe had never met before. In September 1786, Goethe also traveled to Rome. The two stayed close and traveled together among Rome’s numerous ancient relics. They both loved classics and shared common interest. In this painting created during the trip, Goethe is depicted as an otherworldly person who connected ancient and modern times. 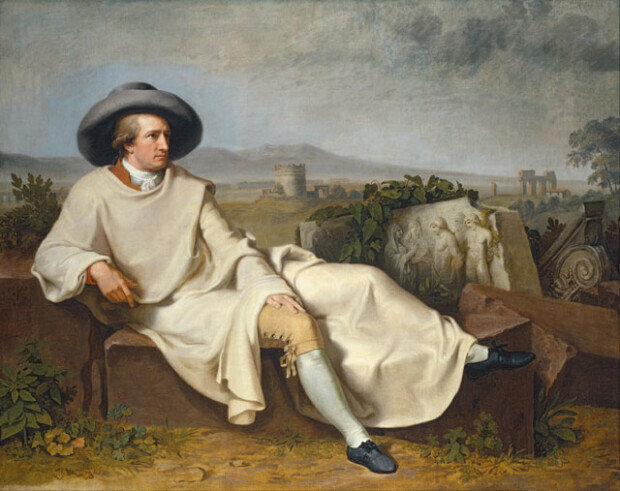 Wearing a broad-brimmed hat and a cream-colored travel coat, Goethe is comfortably leaning against a stone bench, looking far away. The backdrop is the ruin of ancient Rome in Campagna. Goethe’s right foot is set on the real world, while his abnormally long left leg is stretched toward the world of classicism, or an ideal world. This portrait played a great role in forming the intellectual and ideal image of Goethe and later became German people’s paining symbolizing their country’s high levels of intelligence, culture and life. Goethe probably had no idea that he would become such a great person when the painting was created. It was an invaluable requital by his painter friend.